Ninjas In Training : K9 Ninja! This is Roo, the K9 Ninja, he is great! Here he is hanging with some top-notch Aussies. Roo! Thank you so much for this interview! The photos above are from the Wolfpack Ninja Tour where you took out 1st place in the over 40 category. Amazing work! What’s your secret for competing alongside ninjas 10 or 20 years your junior? Thanks for the invite! The Wolfpack Ninja Tour was awesome, and it was great meeting you there! I’ve always been competitive and I’ve always liked challenges. I actually tend to perform better if I’m the underdog, so knowing that I’m competing against younger ninjas gives me a bit more motivation to perform to the best of my ability. That being said, the way that I’ve been able to make the most progress in my training is to focus on competing with myself. It’s fun to try and keep up with the younger athletes, but being a little older I need to be smarter with my training to prevent injury and make sure I’m getting enough recovery time. Ultimately, I just try to become better than I was yesterday. The only thing that is preventing me from hitting that buzzer is my own ability. The more I improve myself, the better chance I have at success on the course. You’ve competed in American Ninja Warrior for a couple of years now, what made you decide to take on such a crazily audacious challenge? It just looked fun! I love obstacle courses, and what better obstacle courses are out there than the ones on Ninja Warrior? 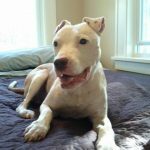 I was also looking for a way to continue to encourage people to adopt their next dog from a shelter or rescue, as well as continue to shed a positive perspective on pit bulls as well. More on that later, but knowing how many dogs out there still need help/homes keeps me motivated to take on any challenge that will help bring awareness to their situation. 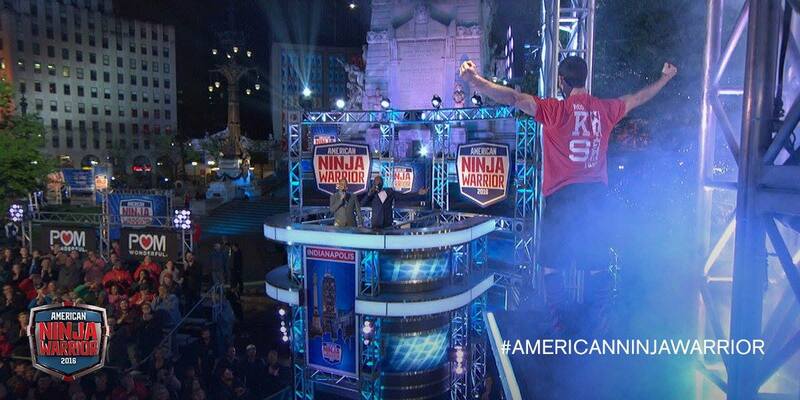 Do you have a standout American Ninja moment? That has to be hitting the buzzer my first year during the Indianapolis Qualifier. 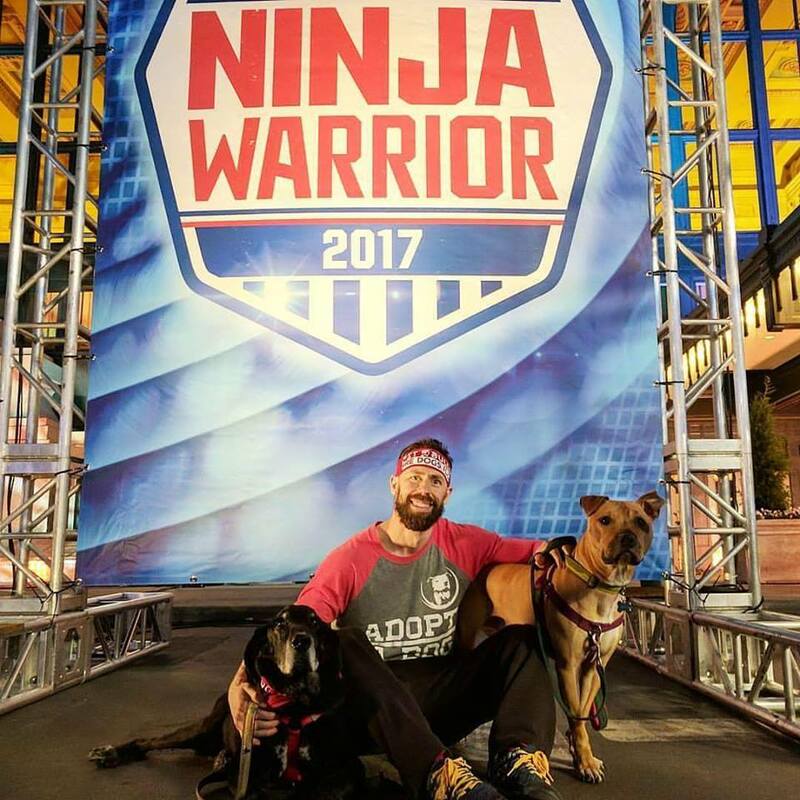 Akbar yelled out to me “Hey, who let the dogs out?” I yelled back – “I let the dogs out!” The whole reason I was competing was to hopefully get dogs out of the shelters and into homes, so to have that moment on the show couldn’t have been more perfect and fitting in my mind. 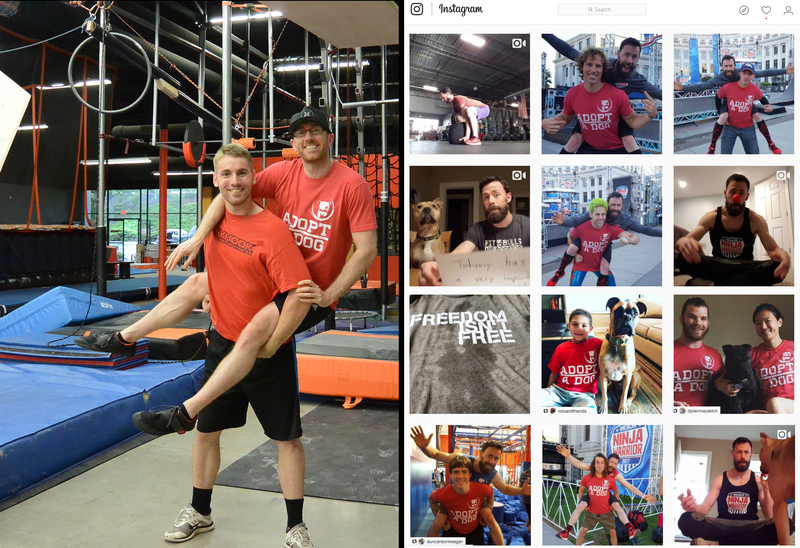 On this blog we get a ton of questions from people wanting to compete on Ninja Warrior asking advice, and long before I met you, I had actually been using you as an example. 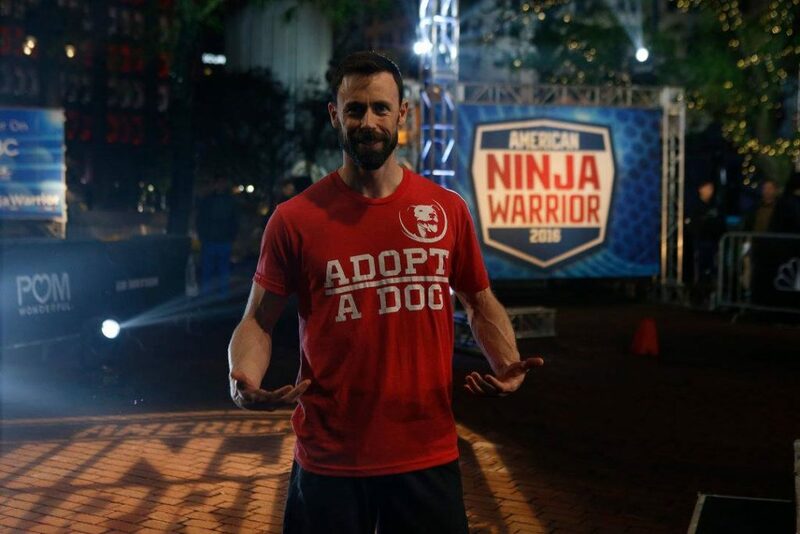 Most of the backstories we see on Ninja Warrior come from a place of personal tragedy, and I’ll admit that the first time we saw you on TV, I’m super tough yet you very nearly brought my partner and I close to shedding a tear… but I love how positive and full of love your story was. It was something you created. Would you mind sharing it again for readers that might not be so familiar? That means a lot because we went through a lot of negative stuff through our journey, but I always tried to keep it positive by overcoming them, and use those situations as an opportunity to inspire anybody watching. Before I was a ninja I had two dogs named Wallace and Hector. Wallace was a pit bull that was going to be euthanized at the shelter. Long story short (seriously, there’s a whole book written about it), my wife and I adopted him and he became a National and World Champion Frisbee dog. My other dog Hector was rescued from the NFL Quarterback Michael Vick’s dog fighting case. He became a Certified Therapy Dog. Both dogs garnered huge followings and proved over and over against the odds that they were amazing dogs that deserved the chance they received. 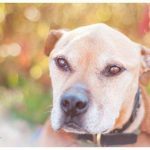 They were an integral part of how I advocated for pit bulls and rescued dogs in general, so when they passed away I didn’t feel like I was having the same impact. I wasn’t sure how best to move forward. I thought if I was lucky enough to get chosen for American Ninja Warrior and do well, it could be an incredible opportunity to leverage a huge platform and continue to advocate for dogs in need.. Fortunately that’s exactly what happened, and I’m just hoping to continue to have that opportunity. I love it! Could maybe use a little more arms yes, but you did great at making sure you could see the shirt which is way more important! Everyone has gotten right behind this cause… you must be proud of the support you’ve generated? Why so many push-ups young Roo? Everyday an average of 22 veterans take their own lives, so there’s a social media challenge where people post videos of themselves doing 22 push-ups for 22 days. Each day you nominate somebody to join the cause by tagging them in your video. When I was tagged I figured it was the least I can do for the sacrifices our service people make each day. I may be known as the K9 Ninja, but I’ll branch out to help others if possible. What is a typical week of training look like for you? When all is going well, I’ll get 3-4 harder workouts in per week. I don’t have a ninja warrior gym super close at this point, so I go to CrossFit Progression and modify their workouts to “ninjafy” them best I can. When I can, I’ll make the drive up to Obstacle Academy on the weekends to get some ninja specific training in. Ideally I would get light recovery movements in during the other days (I really like the rower for this), but that doesn’t typically happen as much as I’d like. Between my job, spending time with my wife and dogs, volunteering when I can, etc, there’s only so many hours in the day. It helps prevent me from over training, something I think more people should be aware of. On the flip side, it makes it a bit of a challenge to keep up with those that are able to train more often. It does. Fortunately I have decent genetics that allow me to get away with not having to be super strict though. I’ve always been pretty low body fat regardless of what I eat, which gets many people peeved at me, but helps me stay lean for the ninja course. My wife, Clara, has hypothyroid issues, so I benefit from her strictness. We typically follow an auto-immune paleo diet. As I mentioned, I’m not super strict about it when I got out to eat, but I do notice a difference if I stray too much. In general I try to eat real food, and stay away from processed ones as much as possible. I’m not big on supplements, but use SFH products for their protein and fish oil. Clara won a Vitamix last year, so I’ve started to do green smoothies in the morning. I’m addicted to those now even though they don’t always taste the best. I get way more vegetables than I did before, and feel better as a result. It’s amazing how my tastes have changed over the years once I got off the processed foods and cut the sugar. I actually crave vegetables now, which is pretty crazy knowing how much I hated them growing up. If you need to fly over to hang out with your namesake, there’s an international ninja competition in Perth in early November… have you ever cuddled and/or boxed a kangaroo? I absolutely need to fly over and hang out with (probably cuddle more than box) my namesake! It’s been on my list ever since I was a kid. My wife and I finally made it to Hawaii this year, and with all the traveling for ANW and Spartan Races, I’m running a little low on the finances and time off work though. Definitely something I’d love to do in the near future though! 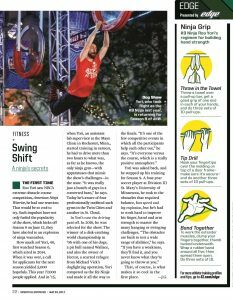 The first season of Australian Ninja Warrior is just about to air… As an experienced dude, do you have any tips for new readers wanting to also train for Ninja Warrior? Practice harder than you compete. 2 specific things come to mind for me. First, I typically don’t use chalk when I train, or when I compete in most local competitions. I know that I’m not going to get it on the course, so I don’t want it to become a mental crutch for my performance. If I really need it I will use it. At the same time, if I can’t hold on to something without the chalk, then maybe that’s a weakness that I need to work on. Second, set up a new course and practice succeeding on your first attempt. If you create a new obstacle, utilize that first time trying it to mirror what it’s going to be like on the show. Most times we want to feel it out before we really try to tackle the obstacle, but you don’t get that opportunity on the show. Most of the people that run the course could complete the course if they had multiple tries at the obstacles. The question is if you’ll do the obstacles the first time you get to touch them, and the one time you have to complete them. Practice that scenario so you’re more comfortable with that type of pressure. Thanks heaps Roo, if peeps want to follow you and your incredibly inspiring social media enthusiasm, where can they find you? My pleasure, and thanks for having me! My Instagram handle is rooyori and K9 Ninja Facebook. Check out Facebook pages of Wallace and Hector. 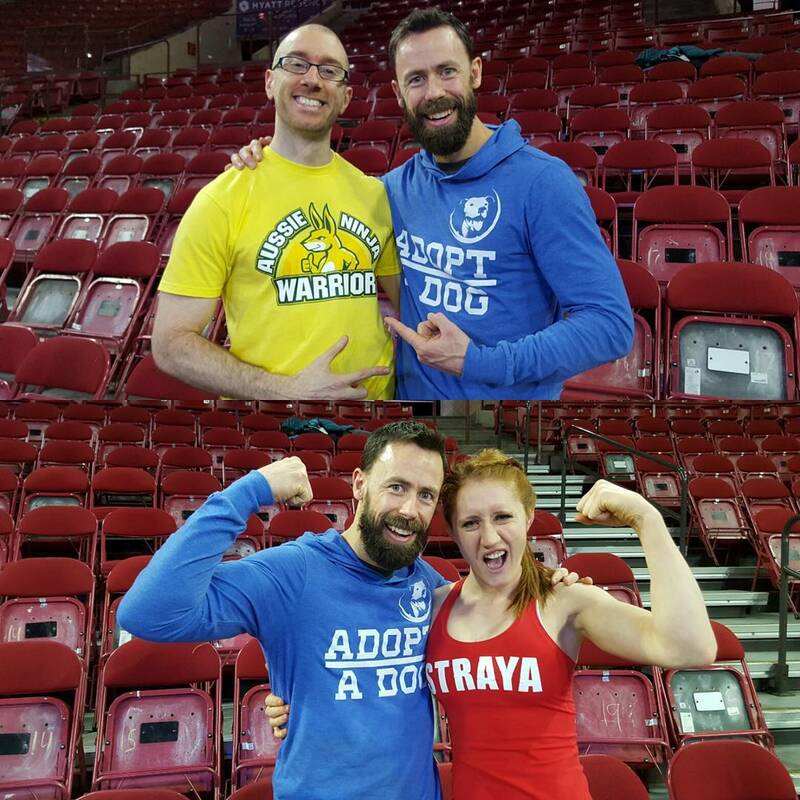 Thanks again to Roo for being so sharing with his training, his goals, his cause and his progress. We wish him the best of luck in his goals for 2017 and beyond. 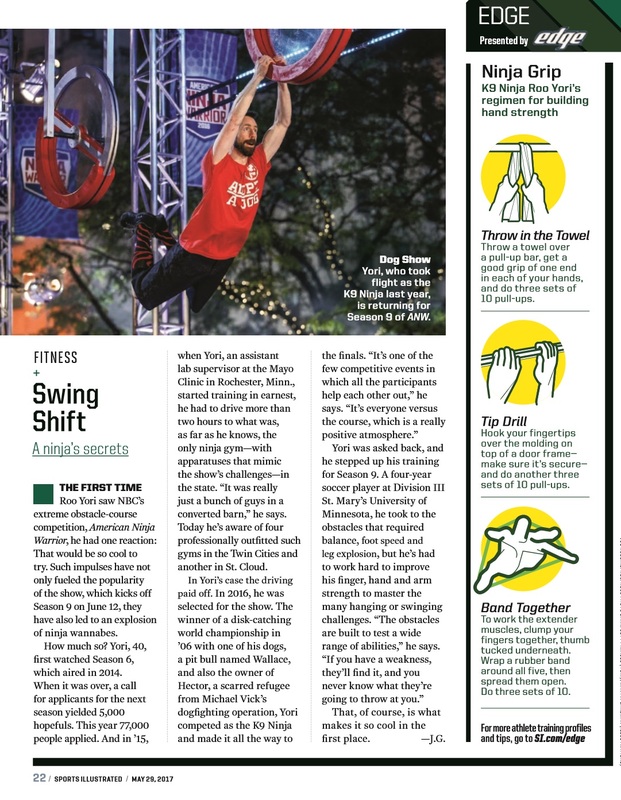 These articles are all about building the Ninja Warrior community around the world and helping each other out. If we help each other out, we all get better, and if we all get better, we can make the world a happier, fitter, more exciting place.